Today, according to various food blogs and holiday sites, is Milk Day. Rumour has it that this day is celebrated as Milk Day because milk was first delivered in bottles on this day, 11 January, way back in 1878. I did some searching to confirm this, but was unable to do so – it seems there was a patent for a milk container issued in 1878, but the exact issue date for that patent was 29 January. While I cannot confirm the milk bottle fact, I don’t see any reason why we should not celebrate Milk Day. Internationally, milk is an important source of human nutrition, and in New Zealand in particular, the milk industry forms the backbone of our country’s economy. A hanging milker device used in a rotary milking parlor. The New Zealand milk industry was started nearly two centuries ago in 1814 when the first cows arrived in New Zealand after being imported by early European settlers. New Zealand milk exports started in 1846, and in 1871 the first dairy co-operative was created in the Otago region. 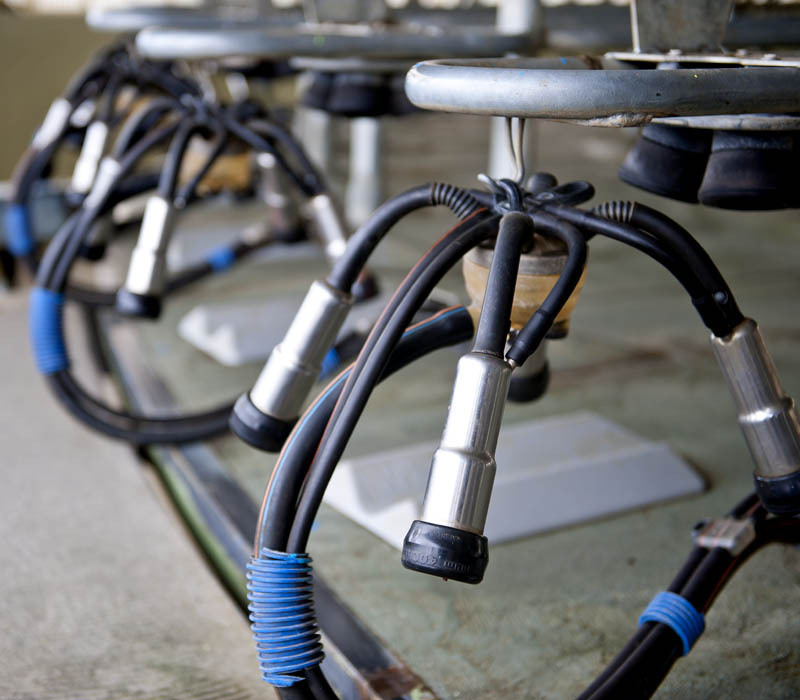 From these early initiatives, the New Zealand dairy industry has grown in leaps and bounds. In 2001, the Fonterra company was formed from an amalgamation of existing co-ops, representing the majority of the country’s dairy farmers. Wholly owned by the more than 10 000 farmers who supply milk to it, Fonterra is currently the world’s largest dairy exporter, exporting to more than 100 countries. It is responsible for about 30% of the world’s dairy exports with revenue of close to NZ$ 20 billion (approx US$ 16.8 billion). While New Zealand leads world milk exports, India is the biggest producer and consumer of milk. India does not, however, import or export milk – it solely produces milk for domestic consumption. Beyond being a direct source of human nutrition, milk is also processed into a wide range of dairy products – cheese, yoghurt, cream, butter, ice cream, chocolate and more. While the majority of the milk consumed by humans come from cows, the milk from buffalo (esp in India), goats and sheep are also consumed in significant volumes, especially in processed form. Over the years, human consumption of animal milk has been linked to a variety of health benefits and risks. On the positive side, milk has been found to reduce the risk of type 2 diabetes, and it promotes muscle growth and post-exercise recovery. Other reported benefits include improved immune function and relief of hypertension. On the negative side, there has been reports of the casein in milk causing autism spectrum disorders, and excessive consumption of milk has been linked to an increased risk of developing Parkinson’s disease, and potentially prostate cancer. While there will probably forever be debates about the benefits and risks of milk consumption, as a source of fat, protein, carbohydrates, salts, minerals and vitamins, it continues to hold significant promise in addressing malnutrition and poverty, particularly as livestock management improves in the developing world.